Boil the sugar and water in a saucepan over the stove. Make sure the sugar is completely dissolved. Set aside. In a large pitcher add the lemon zest, lemon juice, sugar syrup, and 4 cups of water. Refrigerate until cool & enjoy! 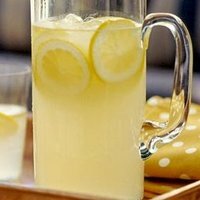 This lemonade doesn't have too much sugar so it maintains much of the tartness of the lemon. Perfect for a nice summer day! Thank you! Oh i love this! Thirst quencher especially during warm days here.